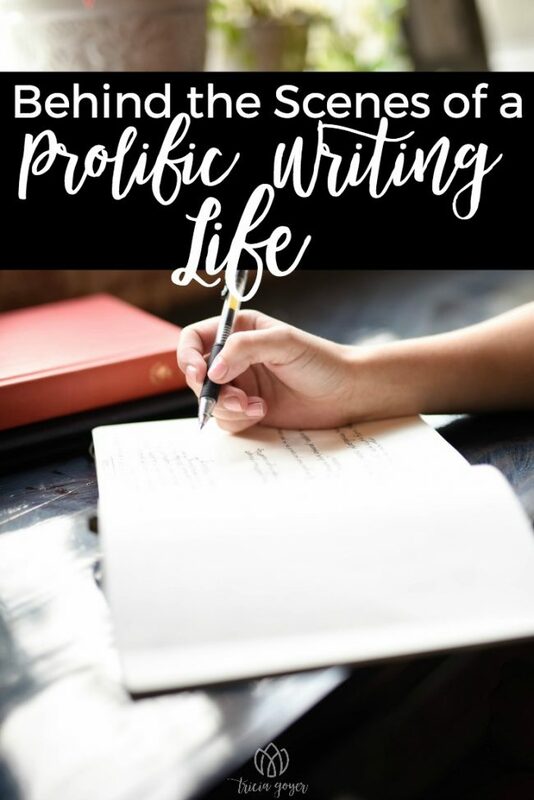 Do you wish for a prolific writing life? Read more for a glimpse into my writing life! I wish I could tell you that my writing life was just as you expected it to be for one to be as prolific as I am. That I lived a simple life centered around nurturing my soul, getting inspired, and slipping away to a tidy office each day to pour out meaningful words through my fingertips. But even though I write multiple books a year, there is nothing simple or tidy about my life. It’s overfilled, overwhelming and messy. Very, very messy. Instead of sitting and waiting for inspiration to come, I grab for it, catching it by its tail and holding on … even as I scurry through my very busy day. If you looked at my weekly schedule you’d deem there truly was no time to write. In my day, I oversee the care for my 89-year-old grandma, I homeschool six kids, and I drive those kids to multiple therapy appointments and extracurricular activities during the week. I care for a home and feed a small army. I lead a teen mom support group, and I’m a wife. I also host a podcast, run a subscription group, and travel to speak a dozen times a year. My life would be full if I didn’t write blogs and books, but writing feeds me—just as sitting quietly before God feeds me. No matter how busy my day is, I take time to read my Bible and pray. And no matter what happens each day I find time to write. Usually, it’s at 6:00 a.m. after I’ve read my Bible and before my kids wake up. Sometimes it’s late at night … depending on how close to a deadline I am. And even though I attempt to build routine into my day, no writing day is typical. Right now I have a book that I need to finish this month, and I have a goal to write 500 words a day, but I haven’t done that in a week. Last month I traveled to visit my daughter overseas (and see my adorable grandbaby!) I’m also discussing cover art with my publisher, and I’m doing on-the-ground research. I’m scheduling podcast guests, working on blogs, communicating with conference organizers, and serving my subscription group community. The writing will come … and believe it or not, it usually comes best the closer to the deadline I get. For some reason, it’s then my brain really kicks in and the words flow. It all brings me joy. Truth be told, the joy I have in my writing life isn’t just about actually writing books. Research brings me joy. Just two days ago I found myself spilling out amazing things I learned about WWII in the Czech Republic to my oldest daughter’s friends. I also find joy in learning that someone in my subscription group has found success. I find joy in chatting with a guest as I record my podcast. I find joy in reading emails from readers and hugging new friends after talks. It’s all work, yes, but it’s fun work. It’s fun to me. Even sitting down to an empty page is exciting. Strangely, that brings me joy, too. My joy comes from trust. These things used to bring me stress, and tears, and anxiety. I’ve cried. I’ve fretted. I’ve tossed and turned through the night with worry more times than I can count. But I can honestly say those times are few and far between now. Why? I suppose I’ve been a writer long enough to figure out that I can only do what I can do, and I have to leave everything (what gets done and what doesn’t get done) in God’s hands. And, actually, that’s a very freeing place to be. I’ve seen books that I thought would hit it big sell far below expectations. I’ve seen projects that didn’t seem all that important blow up into unexplainable successes. I can look back on times when my biggest research questions were answered by people who happened to email me “out of the blue.” I’ve seen book endings wrap up more nicely than I’d dared to hope. I’ve seen good words come out of very hard seasons of life. And I’ve seen a lot of red marked pages from my editor, transform into messages that have nourished people’s souls. I’ve learned that if I’m willing to show up and put my heart into my work, that (with the help of editors) something emerges that can guide, inspire or entertain readers. I’ve seen that when I truly love and serve those around me, God somehow multiples my hours. I’ve discovered that I can control nothing, especially book sales, and they’re not worth worrying about. (Praying about yes, worrying about no.) Yes, I pour myself into marketing and publicity because that’s what my publishers are paying me to do, but I can’t force readers to pick up my books. Yet they often do. Day by day, faithful readers give themselves, their time, and their money to my words. That’s a humbling and overwhelming feeling. I write because I trust. I trust God will guide me. I trust my words will make a difference. I trust that all I DON’T get done in a day didn’t need to be done that day after all. I trust that my life doesn’t need to be tidy, and my days don’t need to have chunks of empty space, for the work to get done. I trust that living my best life will lead to my best words. I trust God IS leading me on this journey. And if you’re reading this, I trust He has you along this journey with me, too. And deep down I know trust is what leads to me being prolific. I trust, and so I show up again, and again, and again. Thank you, friend, for being on this journey with me. I am glad you are here. You bring me joy, too. How amazing is it that God has connected us through this thing called WORDS. This connection isn’t one that I expected either, but I’m thankful for it. I’m thankful for you.